Secwepemc Women Warrior Society said a resounding No! to the Kinder Morgan pipeline today at an illegal engagement session between government and elected chief and council in Kamloops. The session was to push forward the federal governmentâ€™s recent Eyford report on West Coast energy infrastructure and supposed “tanker safety”. 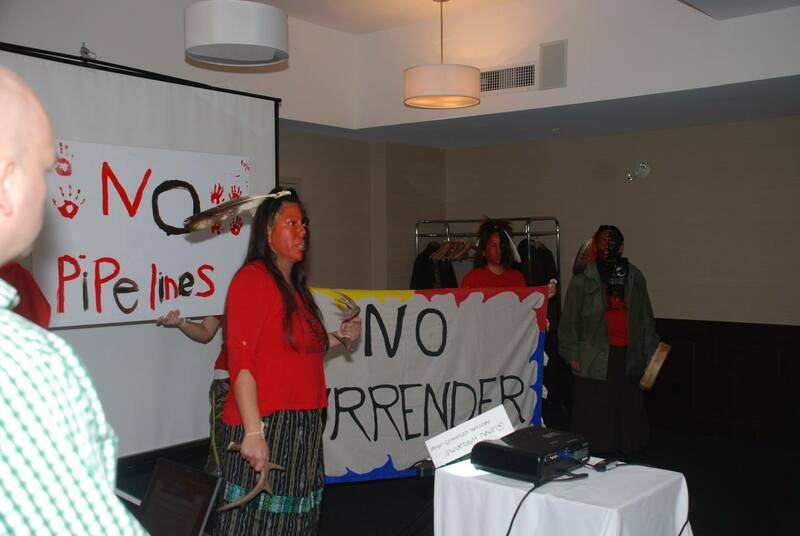 Land is Life: Indigenous Defenders Speak! Grandview Calvary Baptist Church, 1803 East 1st Ave (just east of Commercial Drive). Unceded xÊ·mÉ™Î¸kwÉ™yÌ“É™m (Musqueam), SkÌ±wxÌ±wuÌ7mesh (Squamish), and SÉ™lÌ“iÌlwÉ™taÊ”/Selilwitulh (Tsleil-Waututh) territories. On Monday December 16th, join us in a powerful panel to hear about ongoing frontline struggles by these communities to protect their lands, to assert their nationhood, and to defend their ways of life. These communities have all been asserting and exercising traditional governance, laws, and jurisdiction and have taken up courageous actions to stop mining, oil and/or gas development in their territories. 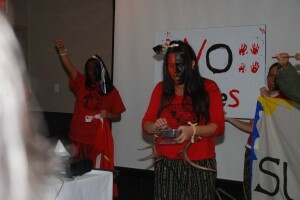 Vancouver, Unceded Coast Salish Territories, May 29, 2013 – Today, members of the Neskonlith Secwepemc Nation and Ancestral Pride Ahousaht Sovereign Territory will join other First Nations and allies in voicing opposition to Imperial Metals (TSX: III) operations across British Columbia. We are Speaking on behalf of our Nation and future generations, our relations, all entities, land, water, animals and plants, when we declare that our Water and Salmon are Sacred. As Secwepemc, we are collectively responsible to take care of our land and water, to uphold all of our responsibilities and follow our Natural Laws, as was passed down to us from Tqelt Kukpi7 and our ancestors. Therefore, we will not, under any condition, compromise the health of our water and our future generations. We unanimously agree that all mining is detrimental to the health of our Nationsâ€™ water. January 2013 – A young Indigenous land defender and father (name currently withheld) living on unceded Secwepemc territory has been detained and deported south of the colonial border by Canadian Border Services Agency (CBSA). No One Is Illegal-Vancouver Unceded Coast Salish Territories has been organizing in solidarity with Secwepemc land defenders for a decade. We have known this warrior and land defender for many years. 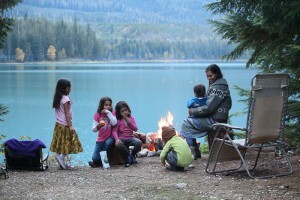 This Indigenous Taino brother and his Secwepemc family have inspired people across Turtle Island to protect the land, to practice traditional ways, to raise proud and decolonizing families.